Like many people, I feel a pang of guilt and frustration about my incessant need to wrap gifts beautifully and craftily. It's wasteful and impractical, and pretty hard to avoid if you care about aesthetics. We tell ourselves over and over again that we'll find a way to reuse it, but it's tough to follow through. There's something nostalgic, however, about simple wrapping. Specifically, gifts wrapped in old newspapers. Granted, it's important to be selective about the sections used (comics rather than obituaries, for instance), but it's got a timeless and thrifty-chic appeal when done right. 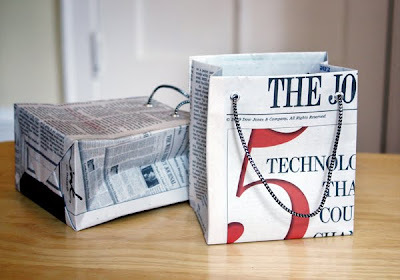 DIY #4 on this fourth day of Christmas is a project that brings the classic newspaper wrapping paper to the next level. 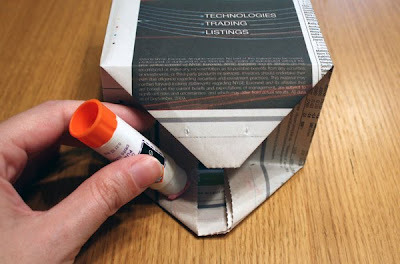 This easy DIY tutorial from How About Orange shows you how to fold newspaper into a super chic looking gift bag. Considering the fact that anything looks cuter in a paper bag, this tutorial is worth memorizing, bookmarking, and passing on to everyone you know. My local newspaper isn't quite as classy or graphic as the examples used in the tutorial, but for something so cute and basically free I will gladly find a way to accessorize to make it work. Since it's getting to be present-wrapping time, make sure you hop over to the tutorial and get started! Do you have any favourite ways to reduce waste during the holidays?